Having the scan on Monday means the weekend is dragging. We should have been going to visit bro-in-law and family but hubby decided we couldn't afford the trip in the end (would have cost near on £200 to be fair with petrol, hotel, meals etc) which leaves me at a loose end. And the weather is nasty so going to the park is out of the question. Soooo we've been baking! Quick trip to Asda this morning for some extra butter, ground ginger, and writing icing, and maybe a lunch in the cafe (shh! 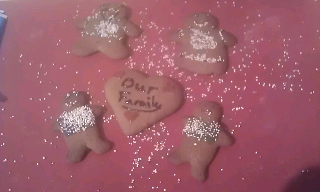 ), then home for a flurry of flour and brown sugar! 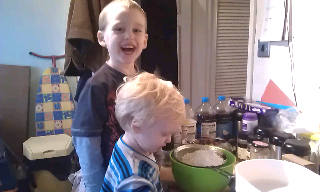 This is the first time I've let Tom get really hands on with the baking and he had a great time. Jack always loves baking. 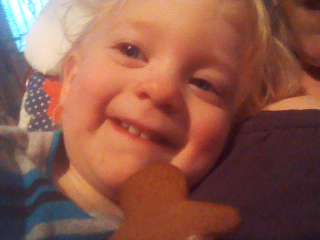 We've followed this: http://www.cookuk.co.uk/children/ginger_bread_men.htm and we have made yummy gingerbread. Jack's had a go at decorating some of them. He's done a Jack, a Tom, a Daddy, and a Mummy complete with Baby Smudge in the tum. Very cute! Won't eat those till Mark comes home and sees them. Now both my boys are munching on their biscuits and some bananas while playing on the cbeebies website, giving me a few mins to do this blog (via my phone) before getting back to the housework.